I find shopping for the right nightstands to be a little challenging. You have to consider the height and scale of your bed, the amount of space you have on either side, your style preferences, your storage requirements and even your spouse’s needs, as the case may be. That’s a lot to think about, or maybe to “overthink”! And if you have a desire to not spend a fortune in the process, it can be challenging to find a set or coordinating mismatched set you like at a price that doesn’t scare you. 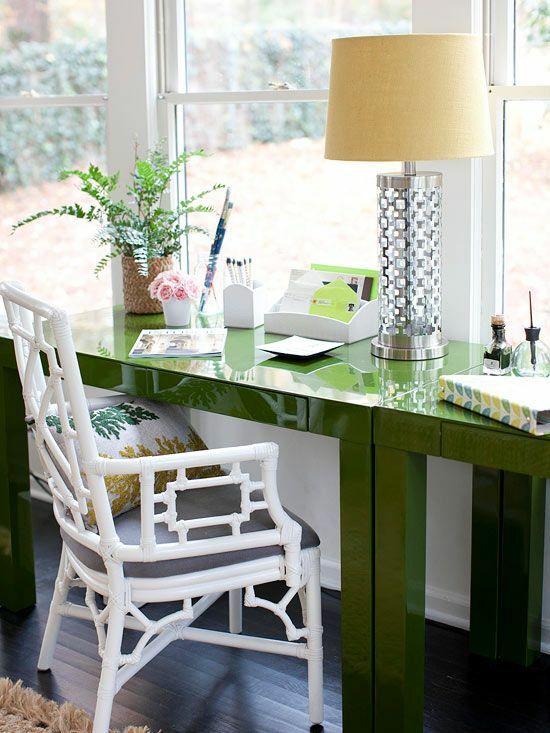 Of course, if you have enough room you can use a small dresser or console table for a nightstand. But even with that flexibility, finding the right size and scale for a small bedroom can prove to be difficult. 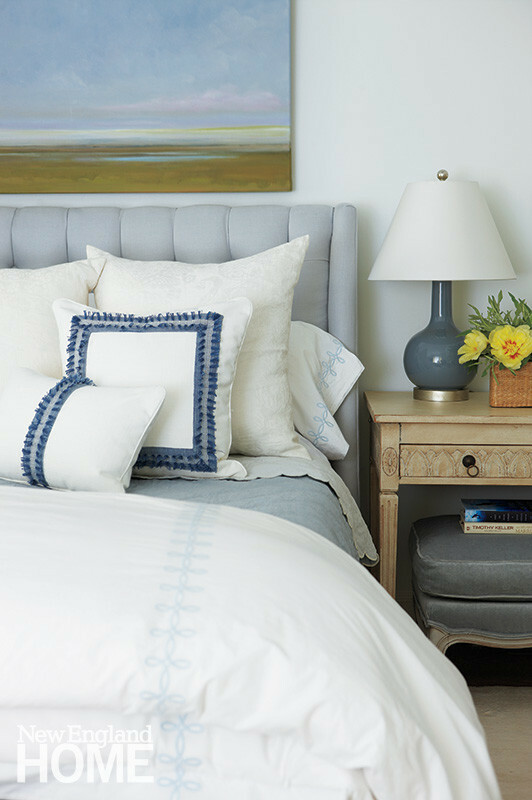 Today we have gathered up 12 affordable nightstands at different price points to give you a head start on the hunt. When shopping, always double check the height, width and depth of the piece against your available space to make sure it will work for your space! Hello! 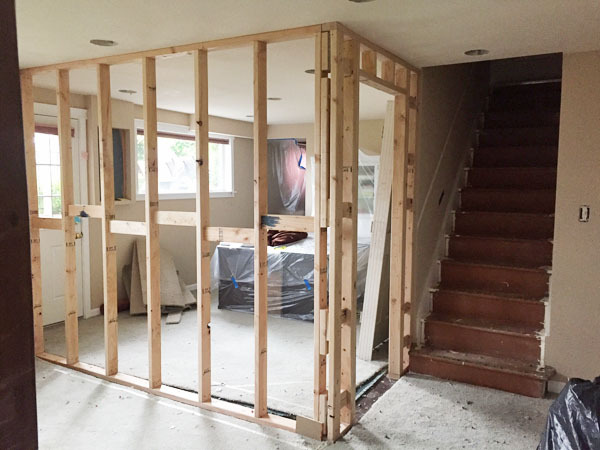 Awhile back I mentioned that we were doing some construction downstairs so I thought today it would be good to update you with the latest. This post will be full of the before and progress shots, because that’s just how it is around here right now. After shots are slow in coming, but progress is always exciting. From what I hear, you guys enjoy seeing the progress too, so this post is for you. My daughter Courtney (who has worked with me full time for over two years now!) and I meet at my house most weekdays for work. I don’t know if you have ever wondered how self-employed people stay focused on their work, but meeting together every day helps us to stay on a regular schedule. While we often have projects to work on or errands to do, we also have a lot of computer work. We really need our own quiet space with a door so we don’t have to be distracted by the dogs and boys and other loud sounds in our day. 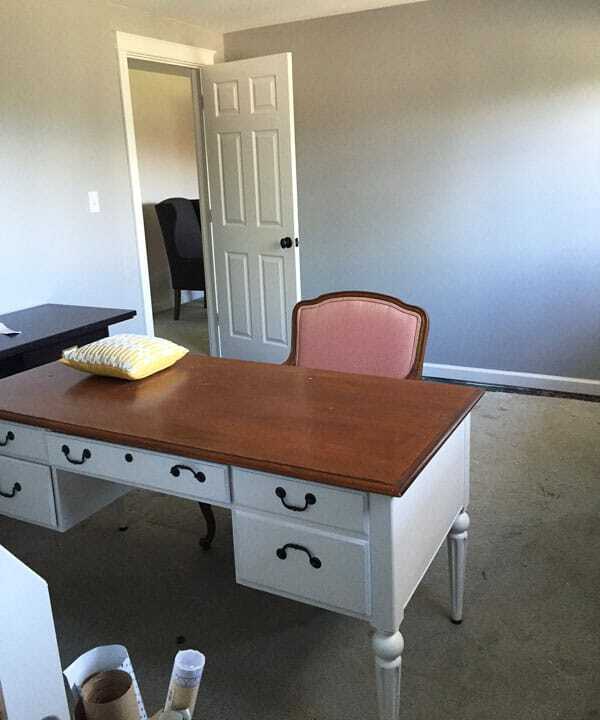 We had a small office in our old house (see it here), but as our business has expanded with more books and projects, we also found we have more to store now. Our original office in this house was just too small for the both of us to work and store supplies so we decided our best option was to make that room a guest room and move our office downstairs. 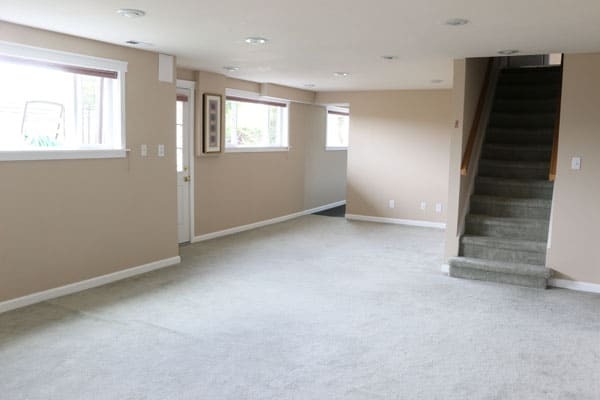 Before we bought this house, we loved that the lower level was so filled with natural light. It’s a walk out basement, but partially underground. It was SO different from many of the other houses we saw in Seattle! 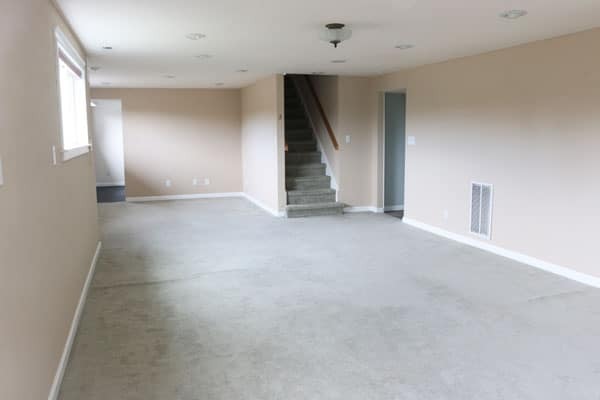 Basements are often small and dark, or have crazy low ceilings so this one definitely was a winner from that standpoint. It also has a white brick fireplace, which was a nice bonus. One of the other aspects we loved about this basement was the flexibility in the available space. 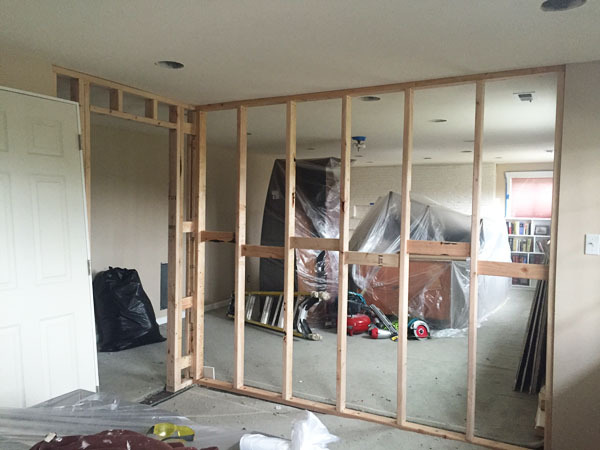 Although we liked the wide open feel, we knew that we would eventually want to section off the space so it would be more functional and serve more purposes. It took us awhile to decide just how and where to section it off, but we finally figured out a great plan that would work for us now and still be flexible for the future. 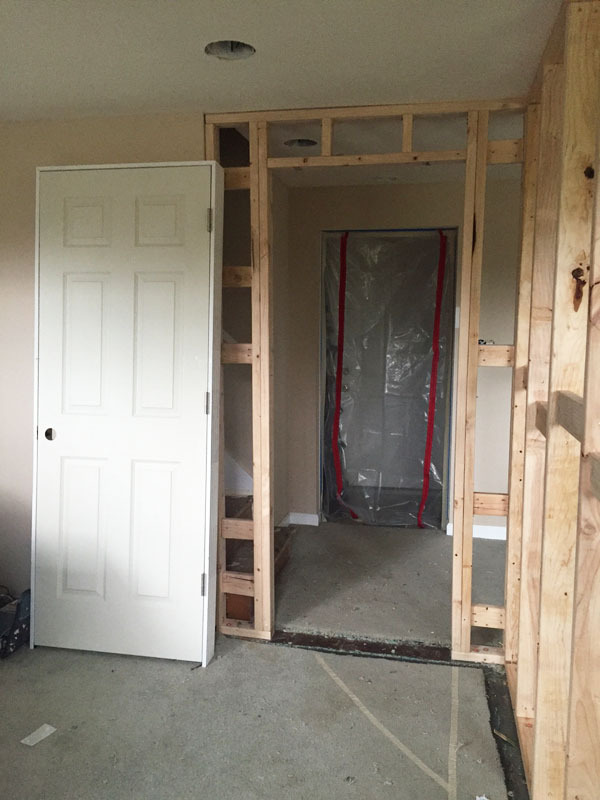 When we hired a painter to paint our interior walls, he brought along a contractor. While we weren’t originally planning to build the wall right away, a contractor was available and the price was doable. We were thrilled that he could get it done quickly and it made sense to just get it all finished at the same time as the paint. Nothing makes me happier than seeing progress in the works! You can get a little peek at a change for our staircase in the photo above. We were happy to have discovered WOOD under the carpet on the steps. 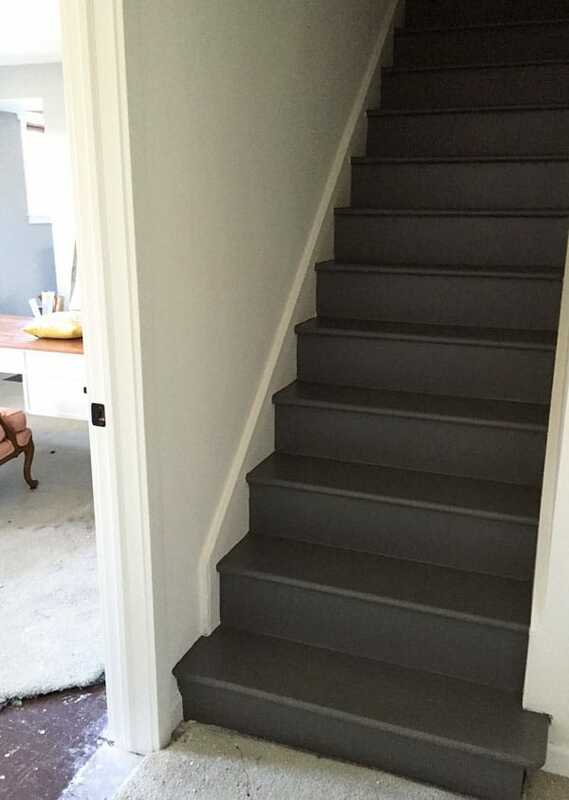 We removed the carpet and painted the steps (Kendall Charcoal from our last kitchen cabinets). 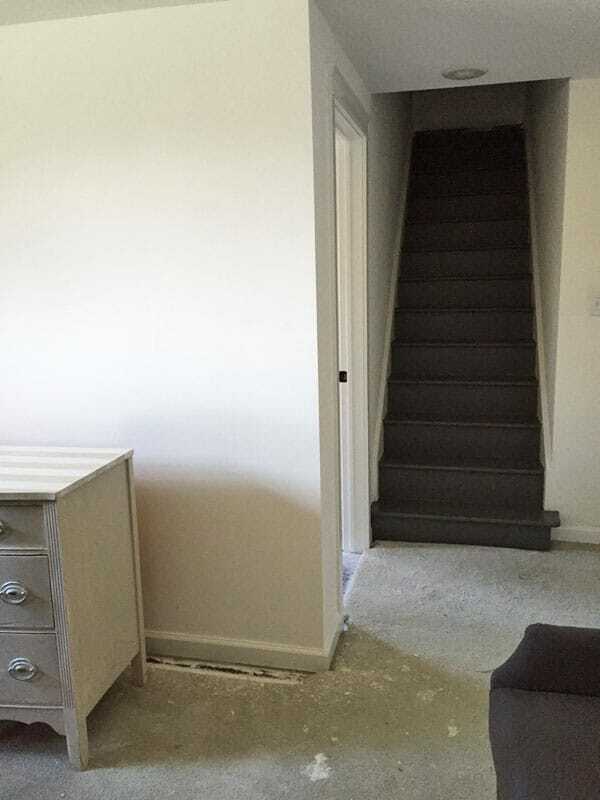 I’ll share a separate stairway makeover down the road, but you can see some sneak peeks of it so far in this post. Excuse the dark and grainy cell phone pics, I always waited to take progress pics until the end of the day when the painters left and I didn’t want to lug out my camera :). The new wall for our office starts near the bottom of the steps. Our office is now a nice size. Not huge, but will work well for what we need. It actually has two sides, one will be the desk area and then the adjoining area (formerly known as “the workout room”) we will use for our studio and projects. We had been excited about using it as an actual workout room to inspire us, but with a small house and lots of needs for space we just couldn’t justify an entire room for exercise equipment (because let’s be honest, working out on a machine doesn’t happen every day). Luckily our laundry room down the tiled hall in this basement is a decent size (see it here) so we will have just enough room for a small treadmill or some other machine there. We love having the outside door into our office. It is nice to open the door to get a breeze as well as to have easy access in and out as needed. Down the road this room would also make an amazing mudroom, so should we decide to relocate our office elsewhere (or even just use the studio side only), this could become the new mudroom entrance. I’ll show you more about the family room side soon, but that space still feels really light. 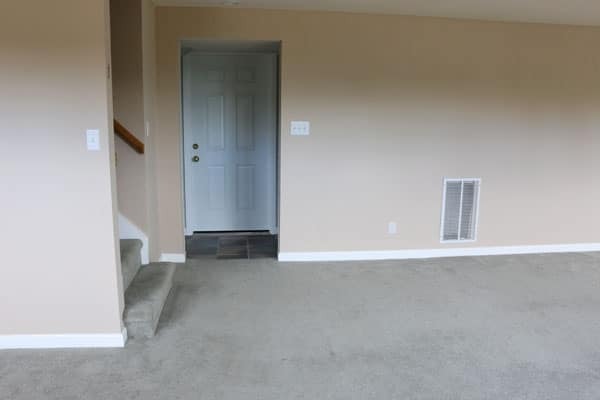 It’s nice that you can still see right through to the fireplace when you come down the stairs so it has an open feel. 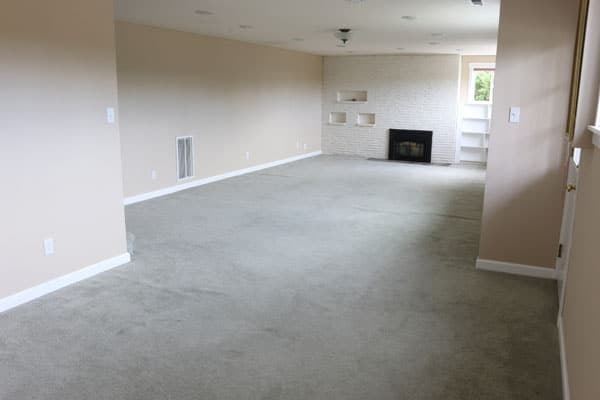 It actually feels just as spacious, too, but definitely more comfortable and functional for furniture since the room ends with a usable wall now rather than meandering off into a less defined and awkward space. All the rooms are still flooded with natural light in spite of my dark evening cell pics, so we are definitely pleased with how it’s coming along! It all feels a bit rough still, of course, but the drywall is now finished and has been painted so we’ve come a long way. 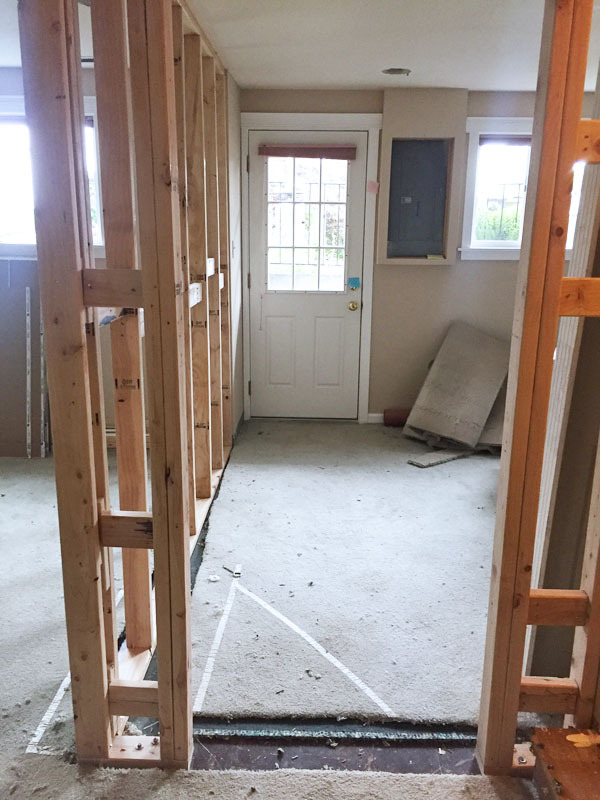 The next steps in this makeover will be brand new flooring and window blinds. The new flooring will make a dramatic difference in the space and finish up the rooms. I’ll have more updates as we make flooring decisions and see more progress. Projects like this always bring a lot of chaos in the house, which I don’t like. I like to feel settled and that’s nearly impossible during big changes! We still have so much more to do and that stresses me out a bit, but it’s definitely going to be worth it in the end. 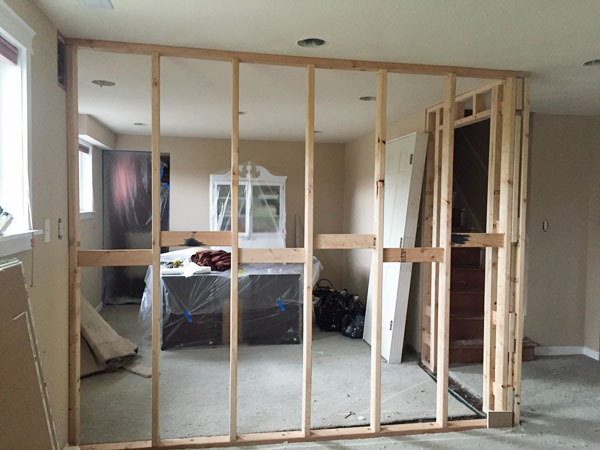 Most of what we are doing is fairly minor stuff in the grand scheme of home remodeling projects, but trying to live in a house while any work is being done is never a super fun experience! All things and limitations considered, we are so happy to have been able to get this far in our first months of living here.